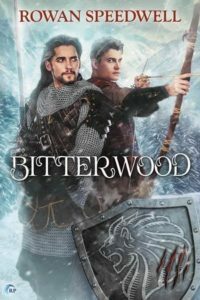 I received a copy of Bitterwood, by Rowan Speedwell from Netgalley. This was a cute, sweet story of little depth but plenty of ‘aww’ moments. For flat out feel-goods this is worth picking up. If you’re looking for fleshed out characters or significant plotting, maybe not so much. I thought everyone was just a little too goody-goody to be taken seriously. Everyone was kind, considerate, generous, and instantly in love. Again, it was sweet and I enjoyed it, but it’s not to be taken seriously. I was however thrilled to see that the mystery of the Daene cat didn’t work out the way I expected and a surprise is always a nice thing to find. Similarly, I liked that the mature, softer around the middle people got a love story too. That is a rare thing. So, for those who like prioritize heart and flowers over twisty plots, this will likely be a winner. This entry was posted in books/book review and tagged book review, M/M, magic, romance on September 15, 2016 by Sadie.